The Titleist 917D2 driver features technology that maximizes distance, forgiveness, and precise customization for every player. The driver’s SureFit CG allows the center of gravity of the club head to be adjusted from heel to toe with interchangeable weights. With these weights, spin and launch conditions can be dialed in for the ultimate customization. The Active Recoil Channel 2.0 has been improved to flex more at impact in order to reduce spin and increase ball speed. 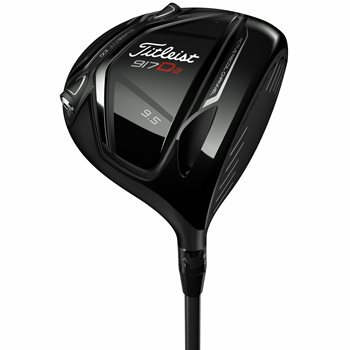 Additionally, the driver features the Radial Speed Face 2.0, which gives off-center shots greater distance. The forgiving 917D2 has a 460cc full pear profile and delivers a slightly higher launch angle and spin rate than the 440cc 917D3 Driver. SUREFIT® CG – moves the center of gravity with interchangeable weights to optimize spin and launch conditions. Review by bigred, 9 months ago. Review by blip, 2 years ago. Review by Todd, 7 months ago. Does it come with adjustable weights and tool? Does it come with weights and wrench? Do you have pictures of the actual club's condition? is there any way to put a stipulation that I don't want anything with a scuff along that top line that's visible from address? Surely some of the bargain condition clubs are in better shape than others ? A new club will come with tool and all accessories. Used ones will not. Is the Mitsubishi Rayon Diamana Ltd. White 70 a D+ shaft ? You can add the product to your shopping cart and proceed to checkout where you can select a payment method and enter payment information.